Nice lamp, but you might need to also buy another power plug and extend the cord. Good for studio use where you don't have to pack and unpack it and bang it into things all the time. Too thin material for other uses. It's a very lightweight lamp. 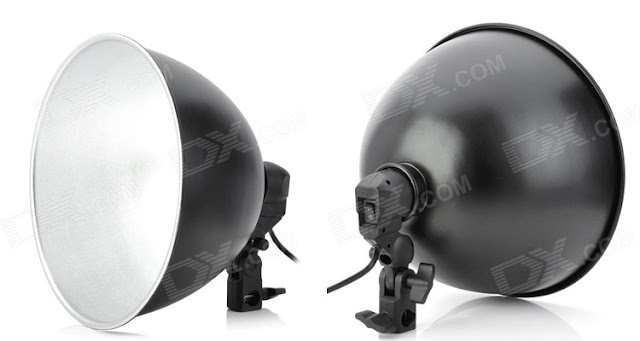 It is adjustable in all directions and it you can attach umbrellas or other equipment to a dedicated hole on the lamp. The plastic feels good and sturdy (everything but the screws and lamp shade is plastic). The dome is made of some sort of aluminum, but the thickness of it is a bit too thin, especially when compared to other similar lamps. It makes it lightweight, but it will get dented or banged up sooner or later. Be aware of the power plug which is US, Japanese or some other, it will not fit in a European socket. The power cord is also a bit short.